As of June 2018, Fort Collins residents and visitors have more options for traveling around town by Bike Share. We've added 23 new bike share stations at key locations around town and increased the bike share fleet to 250 bikes! While this remains a dock-based bike share program, you now have the flexibility to end your trip at any public bike rack around town truly expanding the flexibility and convenience of Fort Collins Bike Share. The system, still owned by Zagster, is now branded Pace. To get started, visit ridepace.com/fortcollins and download the app. Since April 2018 Fort Collins Bike Share has served more than 22,,000 local bike trips and is reaching more people every week! If you haven't yet, take a ride on a Bike Share bike for an easy, convenient way of getting around town that is pure fun. If you'd like to help sponsor new bike share stations, contact us today (dGdyZWVnb3JAZmNnb3YuY29t). To obtain information on Pace equity programs, visit ridepace.com/pledge. For information on sponsorship and volunteer opportunities, visit ridepace.com/partner or email Bike Fort Collins at aW5mb0BiaWtlZm9ydGNvbGxpbnMub3Jn. All riders are encouraged to use helmets, which can be purchased at cost at the Visit Fort Collins office in Old Town Square or Maxline Brewing, located off the Mason Trail. 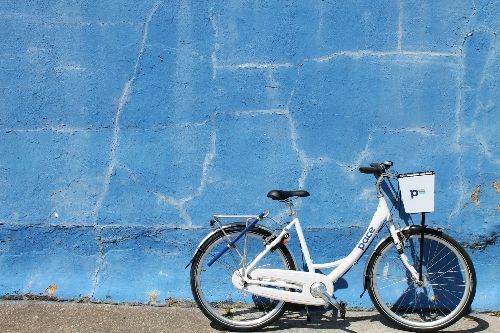 Join us in celebrating the new Pace Bike Share by attending or volunteering at the Hickory Fiesta on June 16, Bike to and from Work Day on June 27. Additional information on these events can be found at fcgov.com/bicycling or bikefortcollins.org. Bike share is an innovative public transportation program offering a network of bicycles for short-term use. Through automated, self-service bike check-out stations, bike share combines the flexibility and freedom of a bicycle with the accessibility of public transportation. Bike share systems enhance mobility within a city, promote tourism and economic development, and offer a fun and healthy way of getting around town. Extending the reach of public transit, bike share systems create connections - connecting people to where they live, work and play, and to other modes of transportation. A great way to stay up-to-date on the bike share world is at bikeshare.com. The Bike Share Business Plan (2014) lays out the vision for a phased future system, as well as an assessment of demand, costs, and steps towards implementation. EPA Technical Assistance (2013): included a workshop with bike sharing experts and summary memo with options for implementing bike sharing. The Fort Collins Bike Library Alternatives Analysis (2012), which analyzed long-term sustainable options for bike sharing. Demos of select bike sharing technologies (2012).